To get the chicken in this recipe nice and thin, you have to pound the crap out of six chicken breasts until they’re ¼” thick. I’ve read instructions in other recipes and on cooking shows that say that pounding the chicken is a good way to get your aggression out, especially if you’re having a bad day. I have to disagree with that pounding chicken philosophy. And I say that because I followed that advice and I got a little too aggressive. The first piece I pounded turned into a mutilated mess. It was thin alright, but not ¼” thin. It wasn’t even ⅛” thin. It was basically see-through so I knew it wasn’t a good thing. And by “see-through” I mean it looked like the ripped skinny jeans of my dreams. I recommend not thinking of the things or people that have upset you or hurt you when pounding chicken. Who wants to think negative thoughts anyway? Especially if you’re on your way to making the most fabulous chicken recipe? I’ve always believed that you can feel someone’s emotions and even personalities in the food they prepare. For example, I can always feel the love when my mother makes her arroz caldo (a Filipino congee-like ginger chicken rice soup). Her strong and sweet personality comes through in the arroz caldo when you get a blast of the ginger, but then it’s tempered with the smoothness of the broth. So as I was pounding the chicken I decided to not think of things that upset me because 1) who needs to be reminded of not so happy things? and 2) I was going to run out of useable chicken breasts. I didn’t want someone to draw the short straw and end up without a piece of chicken and have to eat instant ramen instead. And I know that as a mother, I should make the sacrifice and let my sons’ have the chicken while I eat the ramen. But c’mon. This chicken is so good! It’s every man and woman for himself/herself. Unpleasant thoughts weren’t part of my chicken pounding experience. But I wasn’t thinking of unicorns and rainbows either. I was thinking of something better: my barbell. The mallet hitting the cutting board reminded me of the sound of lifting a heavy barbell off the ground and then dropping it on the floor. There’s a sense of accomplishment and happiness whenever I lift a ton of weight over head repeatedly and then drop it on the ground. 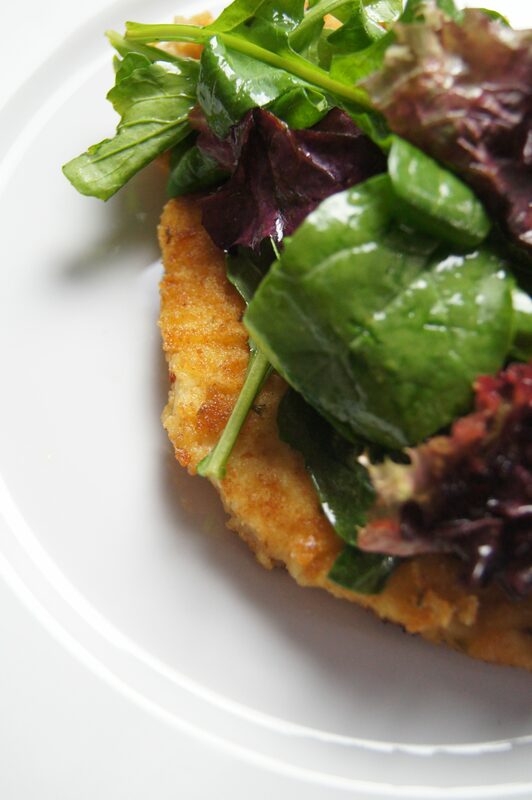 And I was hoping that the feeling of doing something good and feeling happy about it would come through in the finished product of the chicken Milanese. After pan frying the first piece I had a little taste and it was so delicious. I could taste the grated Parmesan cheese, but it wasn’t overwhelming at all. It blended nicely with the seasoned breadcrumbs. And the texture was perfect. Nice and crispy – but not overly crispy – on the outside and so tender inside. I was so happy with what I was making, and I wasn’t even done yet. Between the salad greens and tomato and mozzarella toppings there was still a lot of epicness to create. First, the salad greens with the homemade vinaigrette. 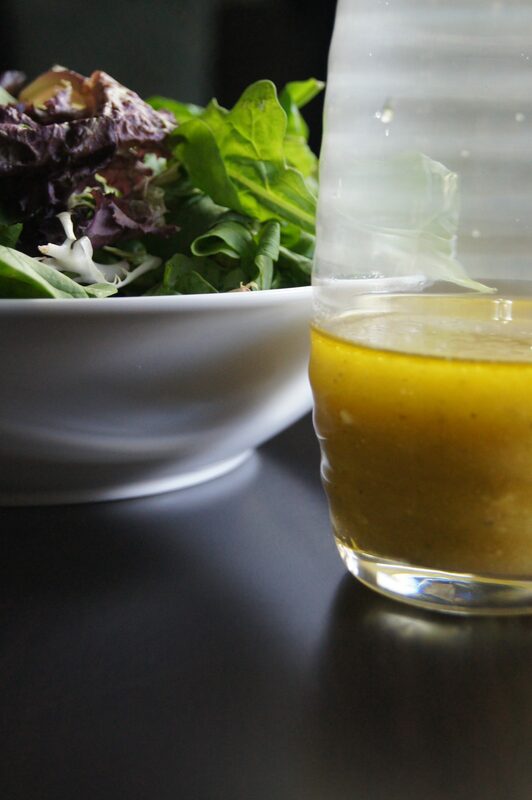 This vinaigrette will blow you away and I’m not kidding when I say that you will never go back to buying bottled dressing again. Sorry, Paul Newman’s. I’ve been making Ina Garten’s vinaigrette for over ten years now and every single time it tastes so good. It will make you go back for seconds for the salad – it’s that good. And this recipe – along with countless other Ina Garten recipes – is one of the many reasons why I think Ina Garten is the Beyoncé of the food world. 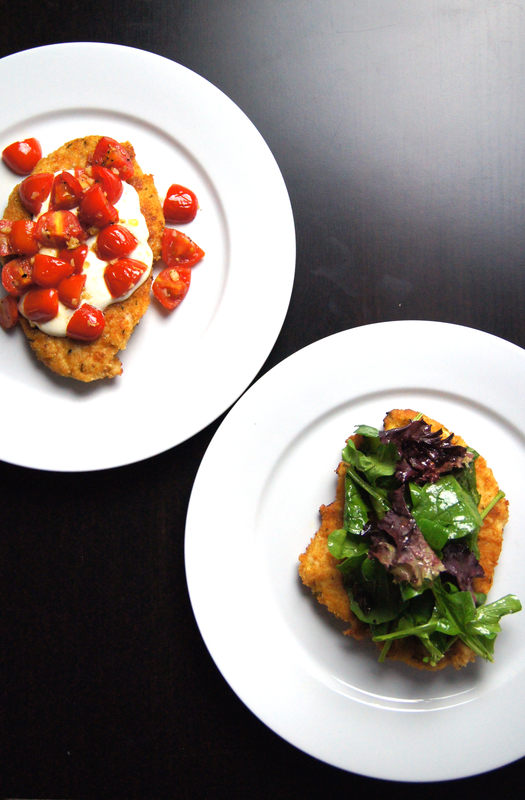 I wanted to make another type of topping for the chicken Milanese that was kind-of-sort-of-but-not-really like chicken Parmesan. My husband, Jon, gave me the great idea of making the Burrata with White Wine and Garlic Sautéed Tomatoes (http://www.thetastypage.com/burrata-white-wine-garlic-sauteed-tomatoes/) that I make for our wine nights in front of the fire. Absolutely brilliant! I did it slightly differently here and used quartered grape tomatoes and fresh mozzarella instead. The burrata was really good on top of the chicken, but it was like performing surgery to cut it. It’s pretty delicate to cut that creamy and awesome center. 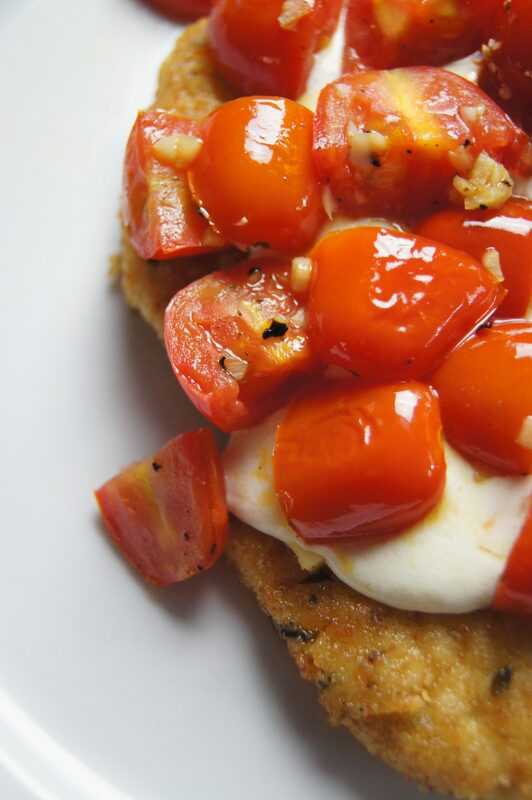 Fresh mozzarella is easier to cut and still melts really well. Another bonus about this recipe is that you can make the chicken ahead of time. Just prep and cook the cutlets the day (or a couple of days) before and store in the fridge until you’re ready to have them. When you’re ready to enjoy them, you can place them on a cookie sheet at 350° for about 5-10 minutes as you prepare the toppings. Easy and absolutely delicious and your taste buds will love you! Pound the chicken breasts between two sheets of plastic wrap until they are 1/4 inch thick. You can use either a meat mallet or a rolling pin. Combine the flour, salt, and pepper on a dinner plate. On a second plate, beat the eggs with 1 tablespoon of water. On a third plate, combine the breadcrumbs and 1/2 cup grated Parmesan cheese. Coat the chicken breasts on both sides with the flour mixture, then dip both sides into the egg mixture and dredge both sides in the bread-crumb mixture, pressing lightly. Heat 1 tablespoon of butter and 1 tablespoon of olive oil in a large sauté pan and cook 2 or 3 chicken breasts on medium-low heat for 2 to 3 minutes on each side, until cooked through. Add more butter and oil and cook the rest of the chicken breasts. In a small bowl, whisk together the mustard, garlic, vinegar, 1 teaspoon salt, and 1/2 teaspoon pepper. While whisking, slowly add the olive oil until the vinaigrette is emulsified. 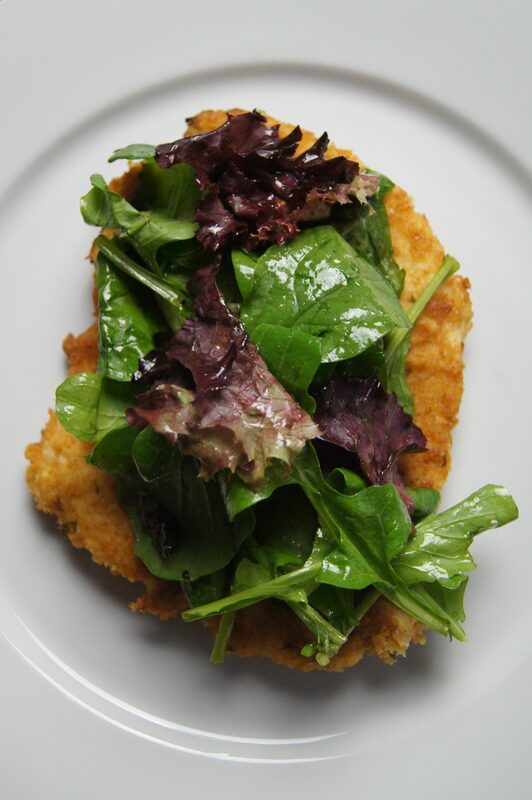 Place the salad greens in a medium bowl and add enough dressing to moisten. Sprinkle with a little extra salt and pepper, if desired, and serve immediately. 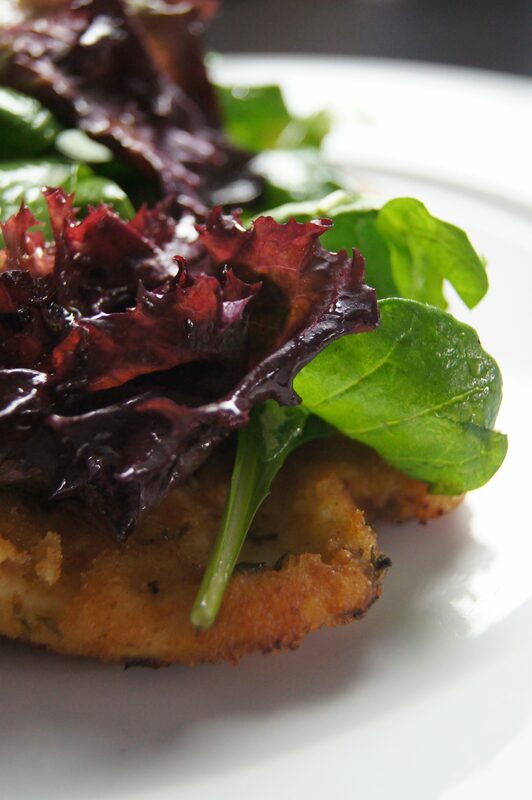 Or place the dressing in the bottom of a salad bowl and top with salad greens. When ready to serve, toss together. Heat oil in a sauté pan over medium heat. Add tomatoes, garlic, wine, salt, and pepper. Bring to a simmer and simmer until wine is reduced by half, about 5 to 8 minutes. 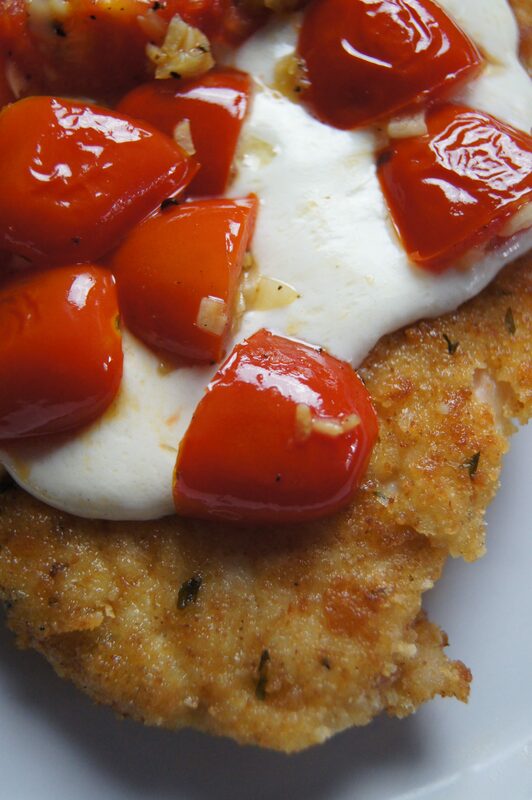 While the tomatoes are simmering, place mozzarella slices on top of cooked chicken. 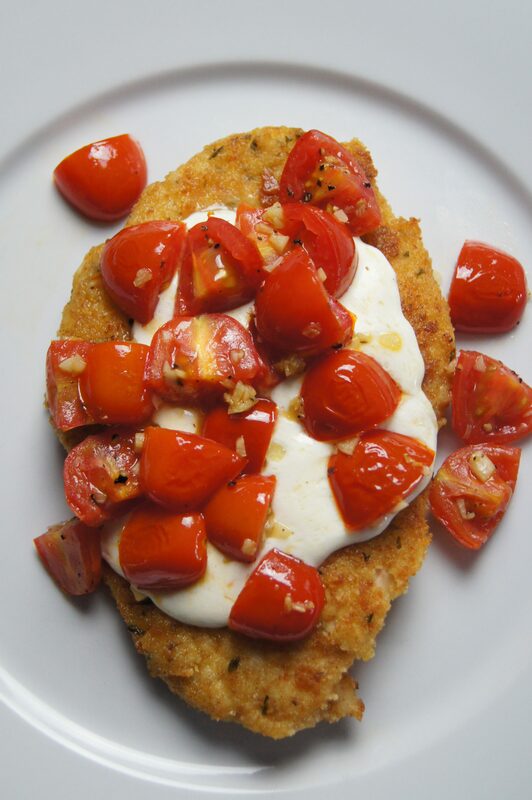 Pour sautéed tomatoes over the cheese and chicken.